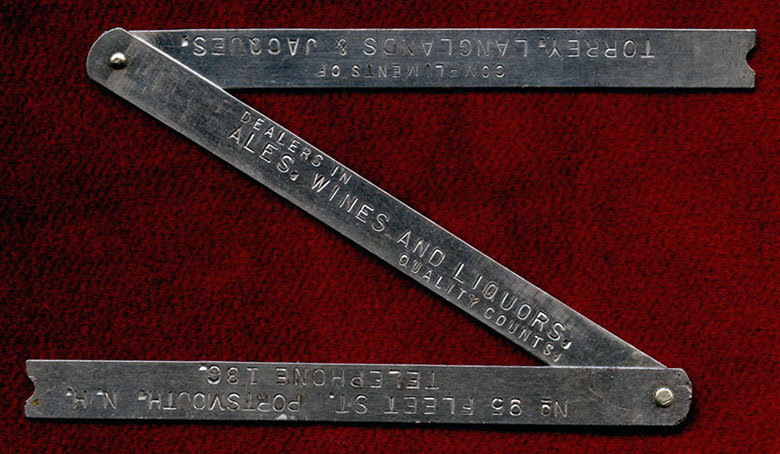 ARTIFACT: This is an advertising pocket ruler from Torrey, Langlands & Jacques, dealers in ales, wines and liquors from Portsmouth, New Hampshire. The reverse of the folding, foot-long ruler lists the company�s address and phone number, as well as its motto (QUALITY COUNTS). SIZE: Approximately 12� length and 3/8� width. CONDITION: 7+ (Very Fine+): The pocket ruler shows some light wear and small spots of tarnish.